Greg, I believe your best bet is to have the crack repaired by plastic welding. It’s the only type of repair I would guarantee not to leak at any point in the future. Patch kits (available in the aftermarket) are great for a temporary repair, but with the racking and twisting going on inside an RV, it will likely crack again. It’s also important to find out why it cracked in the first place. 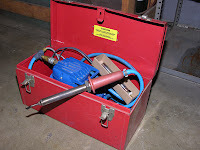 If undue stress is placed on the tank, (by its design or installation technique), it will likely leak again unless a skilled plastic welder performs the repair. I used to teach this repair method to RV service technicians with great success. Any thermoplastic can be welded whether it be a fuel tank, waste holding tank or a fresh water storage container. Here’s an index of similar questions I’ve published in the past. Now, that said, and given your tank is relatively small since it’s in a pop-up, you stand a better chance using a repair kit than say, a large container from a 45-foot motorhome. I’d try the Eternabond method first; especially if there is no stress at the crack location. Fiberglass patches will not adhere properly to polyethylene. So I’d suggest either Eternabond tape or one of the commercial two-part epoxy kits if you cannot locate a shop with a plastic welding machine. The last resort is to replace the tank with one with thicker walls.